The Birmingham Pugin Trail was launched on 1st March 2012 to celebrate the bicentenary of Pugin’s birth, and to highlight the significance of his contributions in Birmingham. The six buildings still in use today form the core of the Trail, some incorporating later designs by other members of the Pugin dynasty. Also included in the Trail are sites with archives or other links to Pugin, as noted below. Click here to download the pdf file of the full colour printed Birmingham Pugin Trail, with map and photographs (copies of the printed leaflet may still be available, free of charge, in some libraries, museums, art galleries, tourist information centres and at the sites on the Trail). Who was Pugin and what was his connection to Birmingham? Augustus Welby Pugin is arguably the greatest British architect, designer and writer of the nineteenth century. Some of his finest work includes the interiors of the House of Lords, the Catholic church of St Giles, Cheadle, and his own house, The Grange, Ramsgate. Born in London, Pugin developed his artistic talents at an early age, and was becoming famous for his Gothic designs by his early twenties, when he was employed to work on buildings in Birmingham. 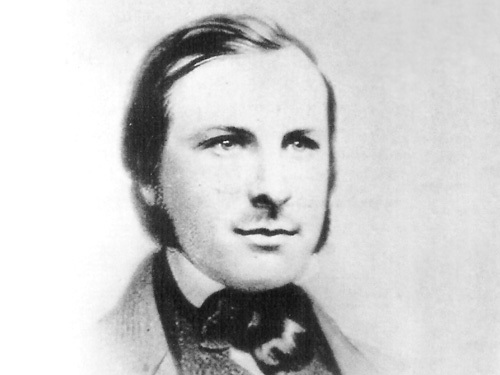 John Hardman Junior (1811-1867), who lived in Handsworth, became a lifelong friend and collaborator. 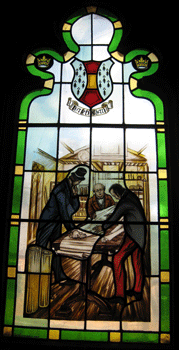 Pugin convinced Hardman to convert his button-making business into producing decorative metalwork and, a few years later, stained glass windows. 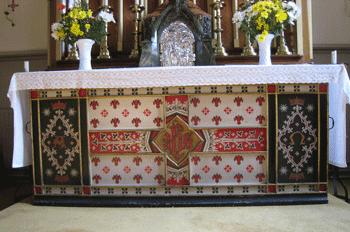 Hardman’s firm developed a range of products made to Pugin’s medieval designs. They were made in Birmingham workshops from 1838 onwards and can be seen throughout the UK and beyond. Examples of this work can be seen at some of the sites noted below. 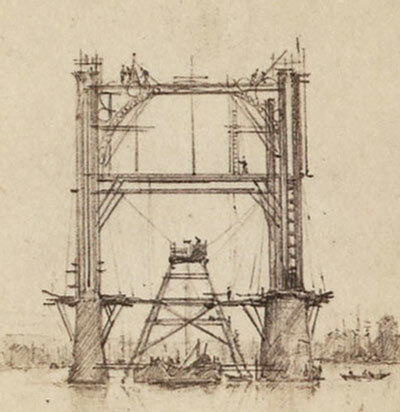 Pugin, from an early age, developed radical ideas about architecture, resulting in many publications which have influenced subsequent generations of architects and designers. He rejected the established Georgian style of classical design, in which priority was given to the symmetry of the external façade. Pugin allowed his house designs to develop functionally, following the needs of his clients. This new approach altered the ways in which domestic architecture developed and changed the residential landscape. His influence on local architects of the Victorian era and beyond is still visible today not only in the many surviving Victorian Gothic houses in Birmingham, but also in the design of later residential buildings. Pugin was a committed family man and, in his short lifetime, had three wives and eight children. After his death, in 1852, his widow and younger children lived in Birmingham for over four years, at 44, Frederick Street, Hockley (original building demolished). His eldest daughter, Anne, married Pugin’s assistant, John Hardman Powell (nephew of John Hardman Junior), who became chief designer for the Hardman business after Pugin’s death, with their home in Edgbaston. Pugin’s eldest son, Edward (1834-1875), designed or extended several buildings in the Birmingham area, most of which have not survived. Pugin’s two younger sons Cuthbert (1840-1928) and Peter Paul (1851-1904), and his grandson Sebastian Pugin Powell (1866-1949), also contributed to the design of local buildings. Over the decades Hardman workshops were based in premises at various sites around the Jewellery Quarter of Birmingham and, over the years, several members of the Pugin family would have visited these sites. The Hardman Studios are one of few such companies with continuous production into the 21st century. Local researchers are gradually collecting evidence to further develop the profile of ‘The Pugins in Birmingham’, much of it still buried in the archives. A ‘Virtual Trail’ is being prepared, to include the many buildings which have not survived; also a guided walk which includes some of those that have! Awareness of the significance of Pugin’s work has increased in recent years, through exhibitions and publications, plus radio and television programmes. This is an internationally significant building designed by Pugin, and opened in 1841, the first Catholic cathedral to be built in the UK since the reformation. George Myers, ‘Pugin’s Builder’ constructed the building; Herbert Minton made the tiles, and John Hardman Junior’s company, in Birmingham, contributed the metalwork and the later stained glass windows. The large crypt has several chantry chapels, including one for the Hardman family, which has been restored. Pugin’s 2nd wife, Louisa, is buried there. Open daily, visitors welcome. Guided tours can be arranged. Guide books and postcards are available on site. The building of King Edward’s School in New Street, which opened in 1838, was a very significant project, as it began the working relationship between Charles Barry the architect, and Pugin the designer. Together they went on to rebuild the Houses of Parliament in London, an iconic British building, recognised the world over. Many of its interior fittings, designed by Pugin, were made in the Hardman workshops in Birmingham. The school building in New Street was vacated in 1935, the school relocated onto its current site in Edgbaston and the New Street building demolished in 1936, after being in use for almost 100 years. Some of the original furniture and fittings are still in use. 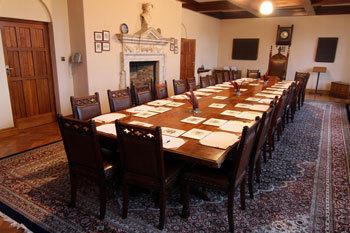 Pictured: Pugin’s Boardroom Table and Chairs c1836, King Edward’s Foundation office, Edgbaston. Still in use. Pugin contributed to the design of the buildings, its interiors, furniture and the spectacular chapel. He was Professor of Ecclesiastical Art and Architecture with a teaching role and, at times, resided at the college, where one of the rooms bears his name. His second son Cuthbert and grandson Sebastian were educated here. This is a working college, and access is very limited, by appointment only. Certain days are open to the public, see website for details and booking arrangements. The website is informative. Postcards, guide books and a history of the college are available on site. The convent was designed by Pugin for the Sisters of Mercy, and opened in 1841. Pugin’s church of 1846, in the convent grounds, was bombed in 1942 but some remains are still visible in the garden. The house opposite, which was the Hardman family home, was extended by Pugin in 1842. It became the presbytery (priest’s house) in 1894, for the nearby St Francis’ church. It has an English Heritage blue plaque, commemorating John Hardman Junior’s contributions to Birmingham (house not open to the public). Today the convent serves as a retreat and heritage centre. Visits by appointment, as advertised on the informative website, group visits can be arranged at other times. 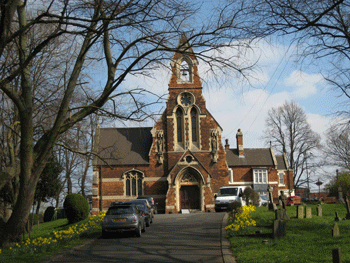 The church building was designed by Charles Hansom and opened in 1850. Pugin designed most of the stained glass windows, the metalwork and vestments. Some were exhibited in the Medieval Hall at the Great Exhibition of 1851. Small exhibitions and open mornings are occasionally arranged. Open for services, visitors welcome to attend, or by appointment at other times. click on the image to visit images of Erdington Abbey's Pugin display (as recorded on the Redemptorists website)! Pugin designed the original building as a mortuary chapel for the first Catholic cemetery in Birmingham, and both were opened in 1850. His son Edward extended the building in 1872. Many of the original features are still visible. Edward also designed the adjoining presbytery (not open to the public), and the original St Joseph’s school buildings, now demolished, but the locations of which can still be seen in the grounds. An original lych-gate can be seen in the cemetery wall to the east. There are permanent displays of items with Pugin’s designs, made by his favourite craftsmen, including Hardman (metalwork and stained glass); Minton (tiles); and Crace (furniture). A large Rood screen designed by Pugin, for St John’s church, Alton, Staffs, is on display in the Industrial Gallery, en route to the Edwardian Tea Room. 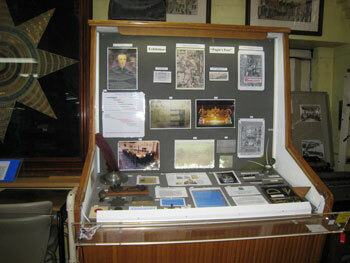 Other items can also be seen in the Birmingham History Galleries. Archives can be accessed by appointment only. Open daily. Free entry. Restaurant. Shop. The city’s central library houses the world famous Hardman written archive, which has an on-line catalogue. It also holds significant collections of photographs, including those of Birmingham’s demolished old buildings and roads, such as the embroidery workshops in Easy Row (near the Hall of Memory), which were used by Pugin. Some of these photographs are also on-line. Now located in the new Library of Birmingham building. See website above for current opening times and the latest news. Open daily except Mondays. Check website for opening times and admission charges. 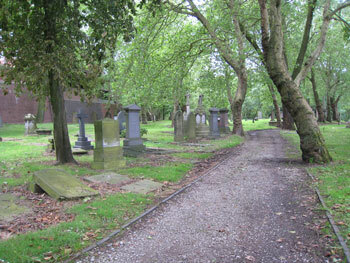 This Nonconformist landscaped garden cemetery, an early example of a growing 19th century national movement, was opened in 1836 on the rural edge of the growing town of Birmingham. Many notable citizens are buried here, including the families of the 3 local companies who built the Crystal Palace for the Great Exhibition of 1851. John Henderson, whose company made and installed the iron framework; Robert Lucas Chance, who made all the glass, and Thomas Osler who designed and made the large and elaborate central fountain. Open daily. Free entry. See website for further information. As well as metalwork, Pugin also designed jewellery. On display here is the story of traditional jewellery making and metalworking techniques used in Birmingham. The methods used have hardly changed since Pugin’s time. Open Tuesday to Saturday. Admission charge. Free access to café and shop. 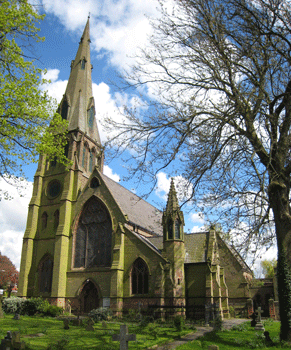 John Henry Cardinal Newman, who founded the Oratory of St Philip Neri in Edgbaston*, had various links to Pugin. They knew and corresponded with each other, and, although Newman was 11 years older, it was Pugin who first converted to Catholicism, in 1835, Newman doing so in 1845. 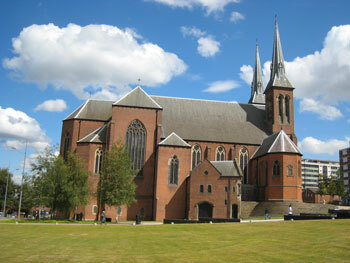 Through their common Catholic faith they are linked to three of the Pugin Trail sites: Oscott College and St Chad’s cathedral, where Newman preached, and the Birmingham Museums Trust, which holds a portrait of Newman by Birmingham artist W. T. Roden, as well as items designed by Pugin and made by Hardman. It was craftsmen from Hardman & Co. who, in the twentieth century, decorated the ceiling of the Oratory church and designed the Stations of the Cross hung therein. However, they had differing visions of certain aspects of the Catholic restoration in England, especially with regard to church architecture and furnishings, as may be seen by comparing the Oratory church with St Chad’s. *This site is an addition to the original 2012 trail. A 15th century triptych, once owned by Pugin, and a medieval oak sculpture, once owned by John Hardman junior’s son, form part of the Barber’s medieval collection. Some of these items are usually on permanent display. The Barber also has a collection of prints by Albrecht Dürer, which would have been of interest to Pugin, who was inspired by this artist, and collected his works. Open daily. Free entry. Shop. Small café. Built in 1903 for John and Margaret Nettlefold, this is a good example of an ‘Arts and Crafts’ suburban villa and garden. Although William Morris (1834-1896) is often credited with the founding of this movement, it was Pugin’s original theories which underpinned its development – as expressed in his publications. Morris and others then developed these ideas, the movement being given its name in 1887. Open Daily, admission charge. Café. Shop. The Cadbury Research Library* holds a number of early editions of Pugin’s publications and 500 photographs of Pugins’ sketches taken in 1865 by Stephen Ayling. The collections are searchable in the online catalogue and the photographs of the Pugin sketches can be viewed at the Cadbury Research Library’s Flickr page, see below. There is also a collection of around 200 drawings from the studio of John Hardman and Co. Material can be consulted in the reading room, which is open to all. * This site is an addition to the original 2012 trail. Iron Bridge during its construction, Rouen.